Each Friday, we’ll comb through as many articles, tweets and podcasts as we can find related to the world of sports betting and daily fantasy sports, and publish the good stuff here. Stumble upon something you think we should include? Email info@bettingtalk.com. Despite losing Super Bowl LII, the New England Patriots open as favorites to win the next Super Bowl. New England sits atop the early odds, at 9-2 to win Super Bowl LIII at the Westgate Las Vegas SuperBook. The Patriots were 5-1 to win Super Bowl LII after winning Super Bowl LI 34-28 over the Atlanta Falcons. The Steelers, at 8-1, are the only other AFC team with single-digit odds at Westgate. 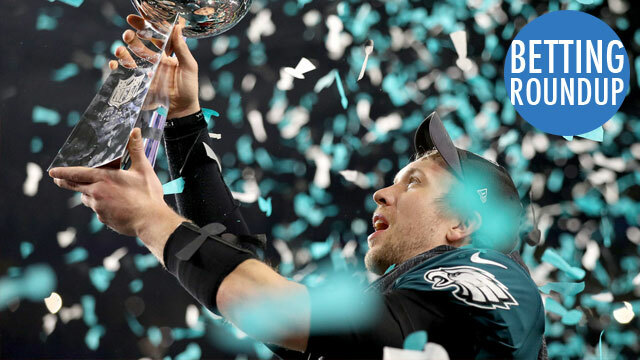 The Eagles have the best odds of any NFC team at 6-1. The Minnesota Vikings (12-1), Green Bay Packers (12-1), New Orleans Saints (16-1) and Atlanta Falcons (18-1) are among the next tier of contenders. Nevada sportsbooks handled a record $158.58 million in bets on the Super Bowl. The books won $1.1 million when the Philadelphia Eaglesupset the New England Patriots 41-33. It’s the smallest win for the books on the Super Bowl since 2011. The $158.58 million wagered shattered the previous high set last year by more than $20 million. DraftKings CEO Jason Robbins said his company would pursue sports betting if it were to become legal. Supreme Court experts predict a decision on the sports betting case will come in March. Another expert agreed with the forecasted over/under. US CITIZENS PLEASE NOTE: The information contained at this site is for news and entertainment purposes only. Any use of this information in violation of any federal, state or local law is prohibited. © 2019 BettingTalk.com. All rights reserved.